No Firings At SEC Over Madoff Scandal : The Two-Way Seven employees were disciplined. But none were dismissed after, an SEC spokesman tells The Washington Post, their performances "before and since the Madoff events" were considered. 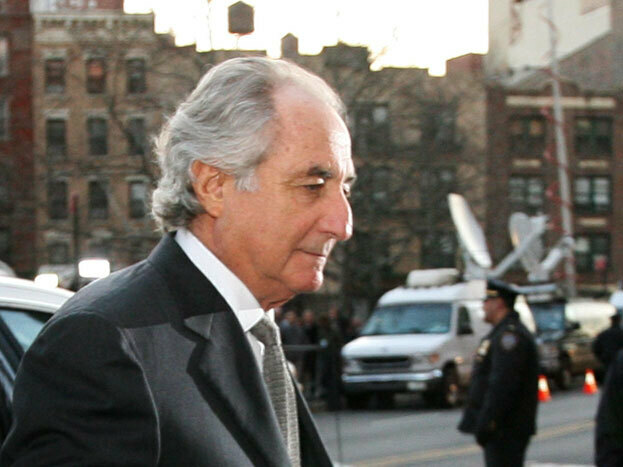 Bernard Madoff before his 2009 conviction. Seven employees of the Securities and Exchange Commission have been disciplined, but no one has been fired, after investigations into how the agency failed to stop Bernard Madoff's massive Ponzi scheme despite repeated warnings that he was stealing billions of dollars from investors, The Washington Post reports. An SEC spokesman, John Nester, tells the Post that the agency considered "all factors relevant to the imposition of discipline, including the employees' performance before and since the Madoff events." The most severe punishment: one person got "a 30-day suspension without pay and a reduction in pay," the Post says. As Morning Edition reported in March 2010, Harry Markopolos "a financial analyst-turned-investigator who spent nearly a decade on Madoff's trail," warned the SEC repeatedly about what what was happening and was "largely ignored." Indeed the SEC's Office of Investigations reported that the SEC "received more than ample information in the form of detailed and substantive complaints [from Markopolos and others] over the years to warrant a thorough and comprehensive examination and/or investigation of Bernard Madoff and BMIS for operating a Ponzi scheme, and that despite three examinations and two investigations being conducted, a thorough and competent investigation or examination was never performed." Most egregiously, the report concluded, when SEC investigators did look into Madoff's actions they, "never verified Madoff's purported trading with any independent third parties." "Despite numerous credible and detailed complaints," the report says, "the SEC never properly examined or investigated Madoff's trading and never took the necessary, but basic, steps to determine if Madoff was operating a Ponzi scheme. Had these efforts been made with appropriate follow-up at any time beginning in June of 1992 until December 2008, the SEC could have uncovered the Ponzi scheme well before Madoff confessed." Madoff is serving a sentence of 150 years in prison for his crimes. At his June 2009 sentencing, the judge said that it would be conservative to say Madoff cost his victims $13 billion.